This high-end subscription service makes it easy for new families with a delightful box of the “most coveted products”, which thankfully are organic and natural! Not sure which baby products are the best for your precious little one? 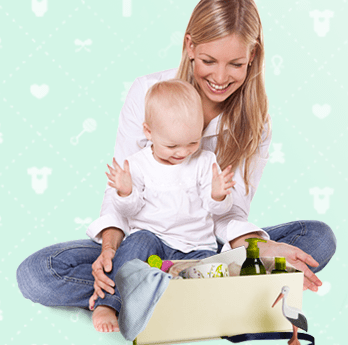 petiteBox is an exclusive baby box service that sends the latest baby product samples from top brands and wellness products just for Mom straight to your door. Each month you’ll receive a new baby box full of baby necessities such as baby lotion, baby clothes, baby food, calming oils and more. The contents of the baby boxes change each month, but only the best baby products are always included. You will never get the same thing twice. Many of my favorite brands are represented in these aesthetically pleasing boxes like [amazon_link id=”B003TXZS3E” target=”_blank” ]Earth Friendly Baby[/amazon_link] and Weleda. It’s also great to discover new brands! We were sent a box designed for the one-month-old baby and mom. It included MAM trends BPA-free pacifiers, Earth Friendly Baby Bubble Bath, a super soft snuggly item by Angel Dear, MD Moms cleansing towelettes, Weleda Iris Hydrating Day Cream, Weleda Almond Soothing Cleansing Lotion, and Weleda Almond Soothing Facial Cream. Cards containing information and advice on breastfeeding, sleep, and your baby’s first month are also included. I think petiteBox is affordable at $25 a month, and I think it would make a really nice gift for a new family! Shipping is free, and you can cancel at anytime. « Organic vs. Conventional: Can We Feed the World?